Entire contents copyright © 2017 Kaylyn Taylor. All rights reserved. The pale blue walls of Revelry Boutique Gallery’s 20 ft x 14 ft gallery space complement the vibrancy of Ewa Perz’s oil paintings. The combination of the walls and her work fill the space with a cool, soft light, evoking the feeling of being submerged in shallow water. The subject matter of this exhibit, Water Strokes, adds to this sensation. Brilliantly colored depictions of seascapes, ocean waves, koi fish, beaches, and boats transport the viewer to a day at the beach or a dive beneath the ocean’s surface. “Limitless”, “Cerulean Sea”, and “Yellow Horizon” have a J. M. W. Turner-like quality. They explore the vastness of the sky and ocean. It is easy to get lost in the detail of a cloud formation, or the glow of light seen in the transition from water to the sky. Vast expanses are depicted in a simultaneously broad and detailed manner. Different from Turner is Perz’ use of a brighter color palette. She allows for a larger range of color saturation and greater contrasting values, which adds more energy and drama to her imagery. “Pink Lilies”, “Green Water”, and “Giallo” harken back to Claude Monet’s Water Lilies Series, which he painted while living in Giverny, France. They share similar subject matter, colors and impressionistic application. Perz’s brushwork though is broader and clearer; both build mass and definition by layering the paint and pulling form from the subtle color variations. “Ocean Waves I” and Ocean Waves II” have a Mark Rothko quality. While her imagery and composition is clearly different, there is a shared intensity and understanding of the effects of color. In the paintings “Quiet Water with Boats”, “At the Beach” and “Quite Water with A Dock”, Perz introduces visual warmth with the use of gold metallic paint. Rather than distract from the work, this gold lends a luminescence to her canvas and a fantastic quality; the surreal gold echoes the escapism that the beach and its warmth can provide. Perz’s use of color is effectively channeled through her skilled brushwork. In “Quiet Water with Boats” long, horizontal, smooth marks communicate the calm of the scene. In “Ocean Waves I”, for example, smooth yet quick brushwork creates the motion of the turmoil caused by the tide and its ever-changing colors. 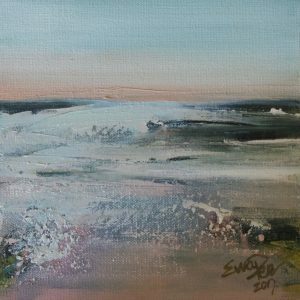 In her smaller work series, such as ‘Seascape with Wind”, “Seascape with Waves”, and “Seascape with Gold”, she uses a palette knife discerningly to create the textures of sand and foam. The texture does not overpower the easy brushwork depicting the water, instead adding purposeful detail and dimension. This is a beautifully arranged exhibit. Moving clockwise from the entrance, the viewer is taken through a series of color related images beginning with the soft blue of a post-storm seascape and it’s seashell wreckage, then transitioning to the deep jewel tone blues below the wave’s surface. Continuing around, the grouping of orange, yellow, and chartreuse compositions of water lilies and coy fish complement the previous blues and prepare the viewer for the subtle warmth of the subsequent grouping of metallic gold-tone works. 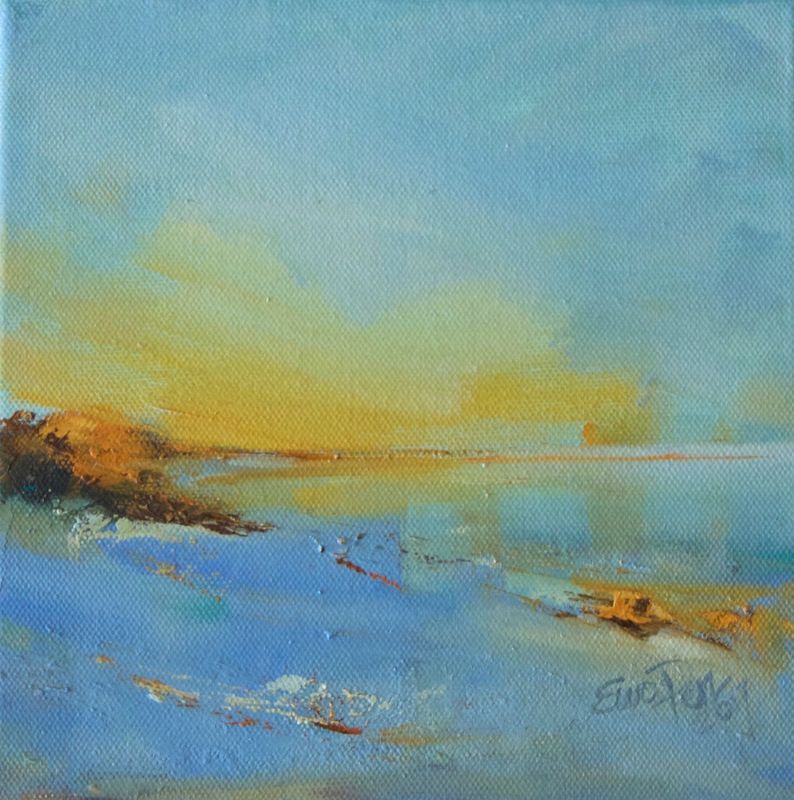 A break in the actual wall allows for a return to the rich blue before again exploring warmer toned paintings such as “Yellow Horizon II”. The overall visual experience is harmonious and calming. This series depicts snapshots of ongoing activity, and are sublime in their representation. Ewa Perz’s masterful use of brushwork to determine the energy of her pieces and a deep understanding of color allows her works to transcend the representational. This ability gives her work an almost abstracted quality that allows her viewer to have a visceral response to her work. Kaylyn Taylor is an artist and writer living in Louisville with her husband and two children. 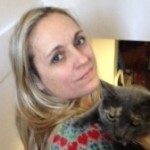 She holds a BA in English & Humanities with a minor in Art from the University of Louisville. She was formerly the General Manager for Savage Rose Classical Theatre Company.